With the adoption of the new Brookswood-Fernridge Community Plan in October 2017, work has been on-going to prepare for the commencement of the Neighbourhood Planning processes for the Booth, Fernridge, and Rinn neighbourhoods in the south and east portions of the community. See map to the right for proposed neighbourhood plan boundaries. General Neighbourhood Planning updates and frequently asked questions will be available and updated regularly throughout the process on this page. As the planning process proceeds, information, updates, and frequently asked questions specific to each neighbourhood will be available on corresponding pages, which will be linked from this main page in early 2019. To receive updates on the Neighbourhood Planning process for all three neighbourhoods, please sign up for email notifications at tol.ca/notifications. What is the current status of the Neighbourhood Plans for Brookswood Fernridge? On October 23, 2017, Council adopted a new Brookswood-Fernridge Community Plan , which replaced the previous 1987 community plan. Council also directed staff to commence with the preparation of neighbourhood plans, for Booth, Fernridge and Rinn, in the south and east portions of the community. As a preliminary step prior to the initiation of neighbourhood planning process, an environmental assessment is being completed. This environmental assessment began in July 2018 and is expected to take approximately 10 to 12 months, with a final report due on or before spring 2019. 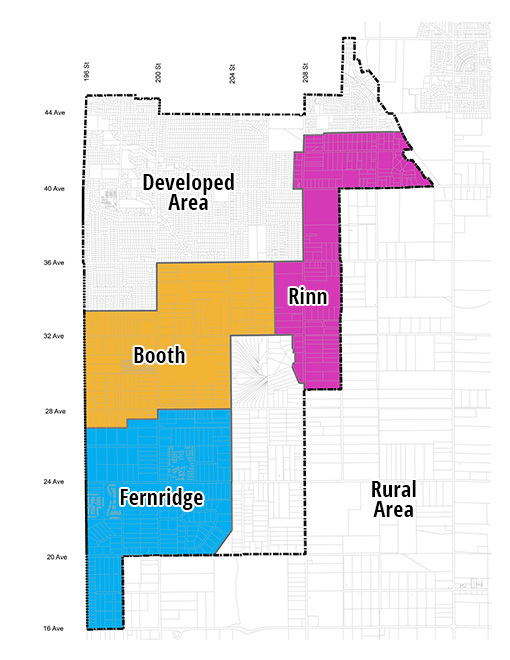 On January 21, 2019, Township Council approved the project Terms of Reference , with amendments, as the next step in the preparation of Booth, Fernridge and Rinn neighbourhood plans. Who is completing this environmental assessment and what does it include? In order to equip the planning process with environmental expertise, staff sought a consulting team with substantial experience and expertise in environmental sciences and engineering, including transportation, water, sanitary sewer and storm drainage engineering, fish and wildlife habitat, plant communities, environmental systems and networks, and conservation strategies. This consulting team were acquired through a common municipal procurement practice called ‘Request for Proposals’ (RFP). Urban Systems, and sub-consultant Dhillon Consulting, provided a proposal that was accepted at the conclusion of the RFP process. When complete, this environmental assessment will seek to verify, among other environmental resources and features, the presence of watercourses and other surface waterbodies, mature tree stands, and other vegetation/plant communities. Outcomes of the environmental assessment will be made publically available. Will new development permits be issued before the Neighbourhood Plans are complete? No. While a municipality such as the Township of Langley cannot refuse development applications, as directed by Council with the adoption of the Community Plan, new development applications in the three Neighbourhood Plan areas in Brookswood-Fernridge will be considered concurrently with the preparation of said plans. From an operational perspective, this means applications will be received, processed in a preliminary way, and held while the Neighbourhood Planning process is underway. Applicants will be encouraged to follow along with process in order to understand emerging policy and ensure the development applications submitted comply with the Neighbourhood Plans that go forward for Council consideration. Is there a Neighbourhood Planning Team? Yes, a Neighbourhood Planning Team (NPT) and 3 Sub-Teams (NPST’s) were established through an application process and Council vote in spring 2019. These teams form one of the many engagement opportunities that will take place over the length of the Neighbourhood Planning project. More details can be found on the Neighbourhood Planning Team page. Staff are actively initiating the administrative aspects of launching a project of this magnitude. More information will be prepared and broadcast over the coming weeks. As this moment, the environmental assessment is the only portion of the pre-neighbourhood plan underway. As the neighbourhood plans move forward, information will be made available here, and through email notifications which you can sign up for at tol.ca/notifications by selecting the ‘Brookswood-Fernridge Plans’ notification category. Staff can be reached directly any time at bfnp@tol.ca.